Victoria Falls is one of the world’s natural wonders and is easily visited on your southern African safari. 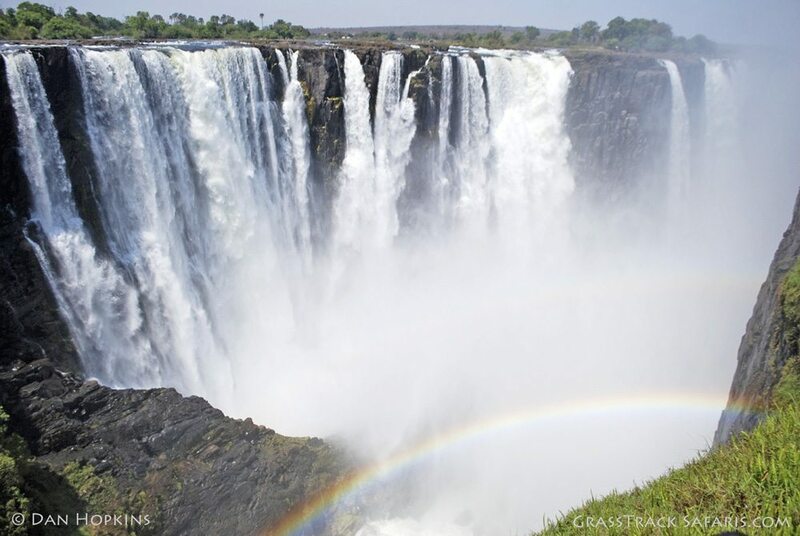 The Falls is formed by the Zambezi River as it cascades into a chasm 300 feet deep and over a mile wide. 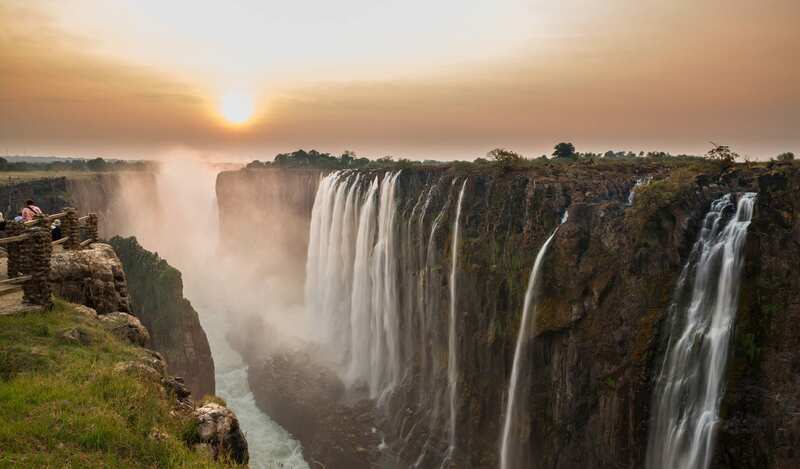 Since the Zambezi forms the boundary between Zambia and Zimbabwe, about ¾ of the Falls is in Zimbabwe and the remaining ¼ in Zambia. Both towns of Victoria Falls, Zimbabwe and Livingstone, Zambia have plenty of lodging, activities, and international airports. There is lots to see and do in the Victoria Falls area and a stopover of a few nights is worthwhile. 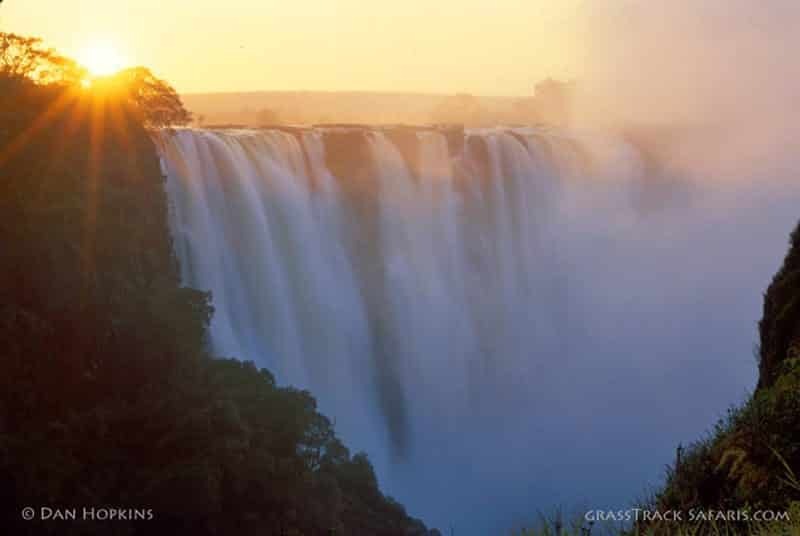 David Livingstone was the first European to see the Falls and was so impressed by the sight he wrote "scenes so lovely must have been gazed upon by angels in flight." The Falls is certainly among the most impressive on Earth and Livingstone was so struck he named them after the then Queen of England. Of course the local Kololo people knew about the Falls and they called it Mosi-oa-Tunya or "The Smoke That Thunders”. This refers to the columns of mist that can be seen from long distances and the thundering river that can be heard miles away. When the river is high the falls are at their most magnificent as the towering column of spray and thunder of cascading water falling into the river canyon is magical. What makes the Falls so magnificent is not only the sheer volume of water flowing over it (20 million cubic feet every minute), but also its incredible breath. Where the river meets the cliff, the Falls is over 1 mile wide making it the longest curtain of water on the planet. This water tumbling across such a long expanse also falls over 300 feet before crashing into the canyon below, creating what is considered one of the natural wonders of the world. Victoria Falls is a National Park and a World Heritage Site. Geologists believe that Victoria Falls was originally formed as a result of millions of years of volcanic activity, tectonic forces, and erosion. During the Jurassic period, basalt was laid down on the plateau around the region by volcanic activity. Uneven cooling of the basalt led to the formation of massive fissures. Tectonic forces gradually shifted the course of the Zambezi until it eventually encountered the fissures and weak areas in the basalt. Through erosion the fissures and cracks grew longer and deeper and the resulting chasm became the first of many waterfalls. Gradually the Zambezi began eroding weak fissures upstream of this first waterfall. 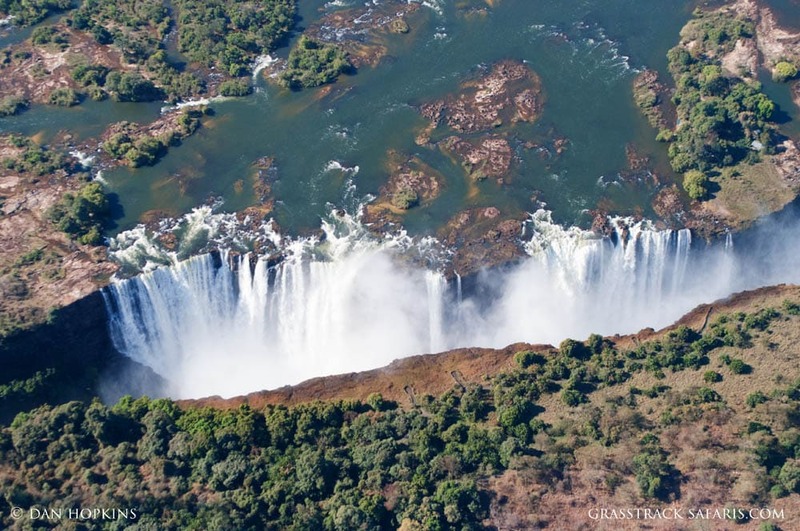 Through millions of years the Zambezi created a series of waterfalls, each slightly upstream of the previous one. The present Victoria Falls will eventually give way to a new waterfall. This process is already starting at the Devil's Cataract on the Zimbabwe side. Evidence of the previous waterfalls can be seen in the zig-zagging gorges below today's Victoria Falls. It's easy to loft lengthy adjectives at Victoria Falls, however, there is much more to Victoria Falls than the waterfall itself. Assuming you can calm your heart long enough to take your eyes off the river, the surrounding scenery of rocky canyons, tropical forests and savannahs is quintessential Africa. From the Zambian side you can hike down to the Zambezi at the Boiling Pot and, if you’re lucky, passing by troops of baboons inhabiting the surrounding forests. Upon reaching the river bottom the scenery is mesmerizing as you peer up at the face of the Falls and the towering cliffs. 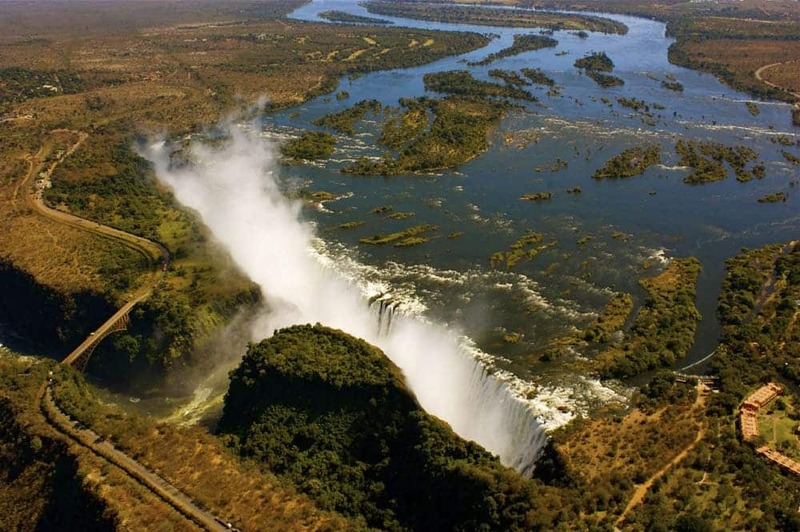 The nearby towns of Livingstone, Zambia and Victoria Falls, Zimbabwe are the tourism centers for Victoria Falls and the extreme-sports capitals of Southern Africa. Adrenaline junkies in need of a quick fix while traversing Africa have a menu of activities to get the blood pumping. In the dry season from mid-August to late-December it is possible to walk across the Zambezi to the islets at the lip of Falls. River rafting on the Zambezi is at its wildest where you will find some thrilling Class 3 and 4 rapids, and some seriously scary Class 5 ones. 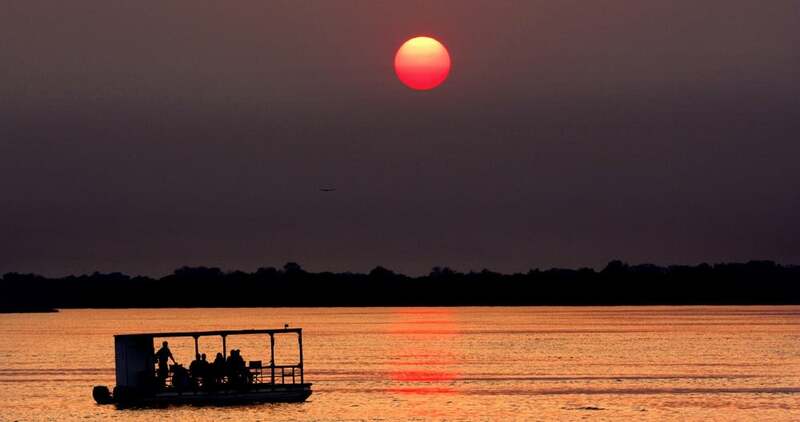 More sedate sunset river cruises are on offer upstream of the Falls where you may see hippos, crocs, and elephants come to drink. Day trips to Botswana’s famous Chobe Park are also possible. Spanning the border between Zambia and Zimbabwe, the Victoria Falls Bridge was the engineering centerpiece in Cecil Rhodes' Cape-Cairo railway. Today the bridge serves a very different function: as a springboard for bungee jumpers. At a height of 364 feet, Victoria Falls Bridge is the world's third-tallest bungee jump, though the fear factor is arguably the greatest. While plummeting to your potential doom, you will be blasted with sprays from Victoria Falls, and then yanked back to life within inches of the swirling eddies of the Zambezi below. To truly experience the size and scope of the Falls spray, you've got to get airborne and the 'Flight of Angels' provides a fabulous vista of the falls, the upstream river, and its many islands. Visitors can also kayak, canoe, fish, go on guided walking safaris, ride on horseback and lunch on Livingstone's Island. Many of our Botswana Safaris and Zimbabwe Safaris visit Victoria Falls. Given its central location and numerous flights into the recently expanded airport, a few days at Victoria Falls is an easy add-on to any Botswana safari. 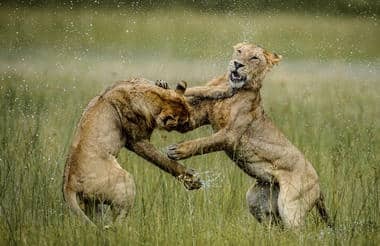 See below for two of our itineraries, both starting in different areas the Victoria Falls region and continuing deeper into Zimbabwe or Botswana. Spend a few days at Victoria Falls before heading south to Zimbabwe's enormous Hwange National Park. This beautiful park is famous for large herds of elephants, lion, and wild dog. 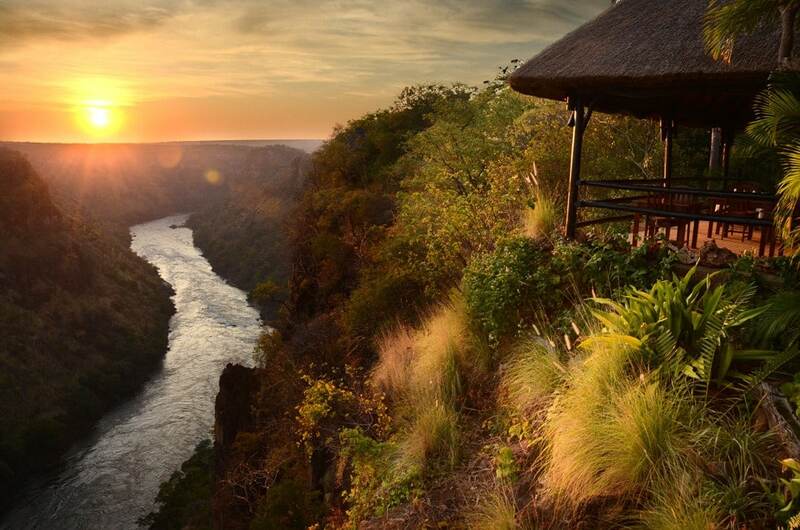 Start your journey at a secluded lodge on the Zambezi River upstream of the Falls for 2 nights. You'll then head to Botswana to visit the Linyanti, Okavango, and Kalahari regions.